We welcome you to find out more about the application process at Ampleforth. Please see below for more information and the option to start the process and enquire now. 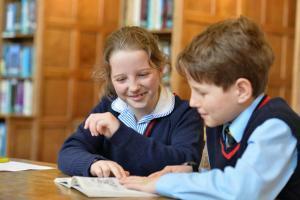 Key entry points to Ampleforth College are into Years 7, 8, 9 and 12. Subject to availability we also accept pupils into other year groups. The application process usually starts approximately three years before entry, with the completion of our Registration Form and a first, individual visit to the school. However, some families only begin the process a year before entry. Whatever your individual needs, we work closely with you to ensure the smooth progression of your application. Individual visits for Year 7 and 8 include the opportunity to see our new Junior House, a campus tour with current students and meetings with key members of staff. Whilst Ampleforth is broadly non-selective, children wishing to join Year 7 and 8 are required to attend an Assessment Day. This covers English, maths, with verbal and non-verbal reasoning, and includes time to have fun and socialise. Further details are available from the Admissions department. Our next Assessment Day is Saturday 2 February 2019. For those unable to attend this Assessment Day a separate visit day can be arranged. Please contact the Admissions department if you are applying from abroad to discuss arrangements. To find out more and to arrange a visit, please contact us. 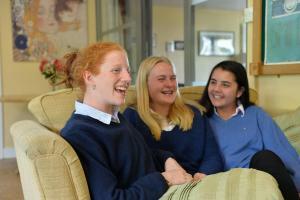 We welcome students from prep schools and state schools, along with overseas students. Conditional offers are sent out five terms before entry. Students coming from prep schools will normally sit Common Entrance Examinations and we work with your school to coordinate this part of the application process. We ask for a minimum score of 50% at Common Entrance. For entry into Year 9 from 2021, all students will be required to sit the Ampleforth pre-test before receiving an offer. The computerised test does not require any prior preparation and allows us to ensure that we can meet the needs of each child who hopes to attend the College. Further details are available from the Admissions office. For students from other schools where there is no Common Entrance, an offer is dependent on meeting our alternative entrance requirements. Each year around 30 additional students are accepted to join Year 12 for our Sixth Form programme. 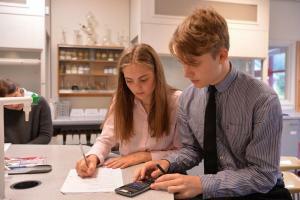 Ampleforth College’s excellent teaching, wide range of extra-curricular programmes and emphasis on developing well-rounded students attract many boys and girls who want to prepare for the transition to university. You can register for Year 12 entry at any point, but most families do so by Christmas of their son or daughter’s Year 10. To be considered for Sixth Form students must visit the school or have a Skype interview with the Senior Admissions Registrar prior to December of Year 11. Successful candidates receive offer letters in December of their Year 11. Offers are dependent on an interview and a reference from the student’s current school and are conditional on successful performance in GCSEs or equivalent qualifications. We request in general a minimum of 3 Grade 5s and 2 Grade 6s for students following GCSE courses. Students who wish to study for BTECs must have a minimum of 5 Grade 4s. If you are an applicant from China looking for more information, please click here. Please contact the Admissions department to arrange a visit or for further information about any aspect of your application to Ampleforth College. Completed Registration Forms can be emailed to: admissions@ampleforth.org.uk or sent to us, please click here.